Facebook introduced this new game called "What's your mental age?" where users will answer some questions and Facebook will finally give a random numerical digit as the answer. Some of my friends played this game and posted the results in Facebook too. What surprised me was some friends who behave as if they are reformatively, superlatively and naturally serious people in life ended up posting results like 18 and 19. That is when I realized that the algorithm for this game should have been designed by someone whose dirty underwear age should be more than 10 years. Do not ask me what connection an underwear would have with this game? If you are analyzing this silly statement of mine, then your mental age should really be less than 3. Even 3 year olds will know that there is no sense in that statement of mine. Why does it matter? I am 31 years old now. If I get a mental age of 17, should I be happy or sad? It simply means I am mentally retarded. There is no happiness in posting that on FB and proclaiming to all my friends that I am mentally just 17. Instead of doing that I should be consulting a doctor to get necessary treatment. When ever I see this lady, I get irritated. I don't know why!!! Some aunties of mine who are in their mid sixties are playing this game on facebook and so happily posting the results as 13,18 and 23 respectively. 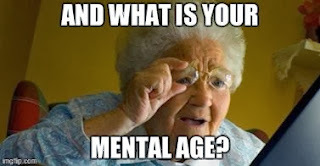 The aunt who posted her mental age as 23 might be speaking the truth. (She will be reading this post and I am glad that this post served the purpose).